An Art Nouveau oak side table/plant stand in the style of Gustave Serrurier Bovy with a solid oak top and stylised floral fretwork panels below with wonderful whiplash legs united by four finely curving stretchers that cross in the middle. A good Glasgow School plantstand by Wylie and Lochhead. An Arts and Crafts oak plant stand with repousse copper heart detailed panels by Shapland and Petter, one sold one in stock. Height 36", Width 10 1/2" Square. Circa 1900. Shapland and Petter. An oak planter with opposing copper heart shaped panels. A wonderful hand wrought iron plantstand with stylised floral details. A Mahogany plantstand by Wylie and Lochhead. Height 31', Width 12 1/4". Circa 1900. A Glasgow Style Oak Arts and Crafts copper bound planter with stylised elongated top's with circular cut-out's. Height 24", Width 13", Depth 13". Circa 1900. 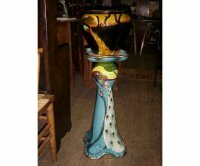 An Arts and Crafts Torquoise plant stand with interlacing organic tubes which spiral around the centre with triangular shaped top and base. Height 30" Width 15". Circa 1900. £SOLD on The Antiques Road Hunt, screened on BBC2. A Continental Jardinere and stand with Peacock decoration. On the base of the jardinere it says Suez. There is a small chip to the rim. Height 34", Width of plant pot 11". Circa 1900. 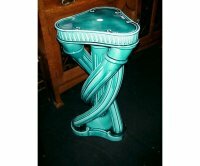 A good quality Arts and Crafts copper bound oak plant stand. A Heals and Sons oak Torchere/plantstand/sidetable with exposed biscuit joints to the top and square legs. Although unmarked it came from Overstrand Hall in North Norfolk a magnificent house built in the true Arts and Crafts style designed by Sir Edward Lutyens and built between 1899 and 1901 which was turned into a convalescent home in the early 1930's and furnished by Heals. 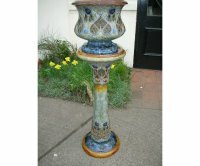 A tall plantstand in the Glasgow style the circular top with moulded edge and sculpturally carved floral tops and stylised floral cut-outs to each foot. Height 52", Width at the feet 14 1/2". Circa 1900. A Royal Doulton Jardini�re and stand. Height 49", the top of the bowl is 14" across. Circa 1900.